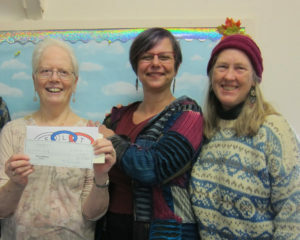 Sierra Roots Founder, Janice O’Brien, beams as she accepts a check from Kris and Robin of Oustomah Lodge. This gift will support Sierra Roots efforts to provide a safe warming shelter for the unhomed during the worst of our Winter weather. Continuing our 2018 campaign of applying the traditional Odd Fellows principle to “Relieve the Distressed” to our local community, members of the Oustomah Lodge #16 Good Works Committee recently delivered gifts of $500 each to two community non-profits. The Lodge’s focus as we move into Winter is hunger and homelessness. Committee members and the Lodge chose Sierra Roots, and the Food Bank of Nevada County as our beneficiaries. 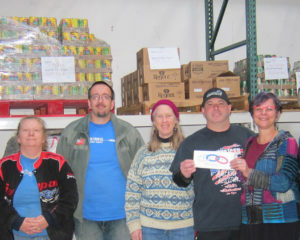 Oustomah Lodge members at the Food Bank warehouse in Grass Valley with Food Bank staff. This donation will support the Food Bank’s mission to serve anyone who finds themselves in need of food. Mark your calendars for the “Night of Giving” supporting Hospitality House, Saturday, December 22nd. Donations will be matched.